It seems that bats are always used in Halloween decoration. 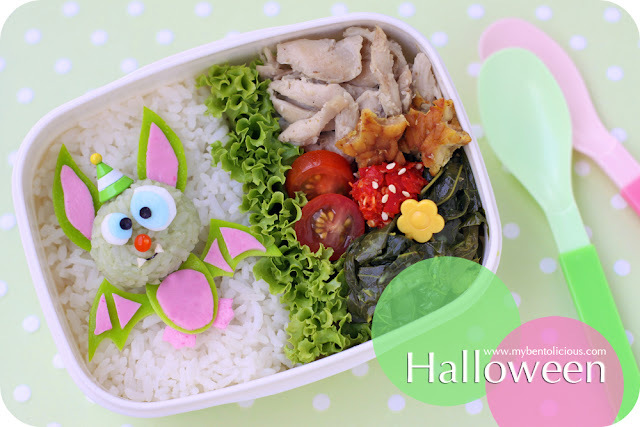 As promised, I didn't want to make something that was too scary for kids' bento. I had been thinking to make a bat since last night. So here you are ... a confused, silly looking bat ready for Halloween with its party hat on. I hand cut all the egg sheet parts for the bat. I kept making the same mistake in cutting the wings part, so I had to re-do it 3 times until I got the perfect size and shape for this bat. Today's cooking for bento are all Indonesian foods. As you can see, I put small amount of sambal (chilli paste) in the bento. It wasn't too spicy so I hope Little A can start eating a mild spicy food very soon. I just have a little time for online this week. I will try my best to reply all of your comments and emails as well as checking on everyone's great posts. Inside the box : opor ayam (Javanese braised chicken in coconut milk), cherry tomato slices, sambal (chilli paste), tempeh, and cassava leaves cooked with coconut milk. @Shane : Thanks a lot Shane! This is the most cute BaT I ever seen. You never cease to amaze me Lia! That is the cutest bat ever, and definitely not too scary :) I love the pink, and his little teeth, too cool! Love this silly bat, n so much details! @Bentomonsters : Thanks a lot! @melonpan : Thanks a lot! Oh my gosh, that bat is too cute!!! What a great bento Lia! Absolutely adorable! That bunny couldn't be scary if it tried, it's way too cute!